The transformation of the Cleveland Browns from laughing stock to contender was completed on Tuesday night when the Browns traded for wide receiver Odell Beckham Jr. The Beckham trade instantly transformed the Browns from a team on the rise to a legitimate contender in the AFC. Cleveland is not only the best team in the AFC North, but they are viable threat to the Patriots. Make no mistake about it, the road to the Super Bowl will still go through Foxboro next season. As long as Tom Brady is playing and Bill Belichick is coaching the team, the Patriots will be the favorites in the AFC. Teams like the Chiefs and Browns however are closing the gap. They are not only playoff contenders but Super Bowl contenders as well. I know it is hard to believe that the Browns, the same Browns who were 1-31 under Hue Jackson are now one of the teams to beat in the AFC. The transformation of this once morbid franchise seemingly happened overnight. It is a credit to the job general manager John Dorsey has done in the past year and a half of transforming this once once putrid roster into one of the best roster in the NFL. So what makes the Browns a viable threat to the Patriots? Two things. Youth and talent. Going into last season, the Browns had the second youngest roster in the NFL (25.3 yrs old). Only the Cincinnati Bengals had a younger roster. It is eye popping how young the Browns. Look at the ages of their top players. The average age of the Browns nucleus is 23.5 years old. It is scary to think that if this team stays together for the next four years and plays up to their potential, they could win at least one Super Bowl. I know naysayers would tell me to pump the brakes but on paper, this is arguably one of the three most talented rosters in the NFL. I know what is on paper doesn’t necessarily translate but if it does, this team will bring a Lombardi Trophy to Cleveland. The talent level is undeniable when it comes to the Browns. Much of the credit for the construction of this roster has to go to former general manager Sashi Brown, Brown laid the foundation by acquiring future draft picks and current general John Dorsey capitalized on that draft capital by using it to make trades that greatly improved the roster. Of course it also helped that the Browns went 0-16 in 2017 and landed the first pick in the draft. A pick they used to draft Baker Mayfield. Cleveland will pose problems for opposing teams offensively and defensively. Offensively, they will be able to beat teams in a variety of ways. They will be able to pound the ball with Chubb and Hunt when he is reinstated and they’ll be able to throw the ball effectively in all three levels. When Cleveland lines up in 11 personnel with Beckham, Landry, Callaway, Njoku and Chubb, that might be the most talented skill group of any team in the league. The Browns offense will get all of the attention but their defense is just as talented, especially the Browns defensive line. Cleveland will get consistent pressure with Myles Garrett and the recently acquired Sheldon Richardson and Olivier Vernon. The linebackers are average but as long as they can cover and fit into the coverage schemes, the Browns won’t need them to factor into the pass rush. Cleveland could use another safety and a corner to play opposite Denzel Ward but Dorsey will be able to address those needs in the draft. The Browns have won the off-season. Let’s see if it translates to success on the field. The pieces are in place for them to finally make a legitimate playoff run. 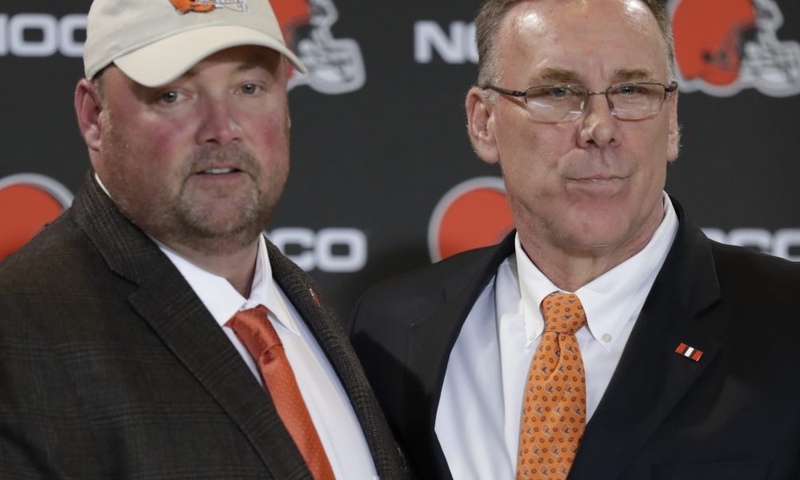 If it all comes together and the Browns can meet the lofty expectations placed upon them, they will be a threat to the Patriots next season and beyond. Posted in Patriots Tagged Cleveland Browns, New England Patriots, Odell Beckham Jr.